Did you know your credit card information can be stolen out of thin air when you’re doing something as simple as waiting in line at the grocery store? Today’s thieves have an alarmingly easy way to electronically pickpocket you without you ever knowing. What makes this possible is RFID (radio frequency identification) technology, embedded in millions upon millions of credit, debit and other ID cards. Fortunately, there are products called RFID wallets than you can use to help protect your credit or debit cards from scammers. On the surface, RFID technology most resembles a merchandise barcode and barcode scanner. But unlike barcode technology, RFID operates through radio waves and consists of three parts: an RFID tag, an RFID reader and a scanning antenna. These RFID tags (sometimes referred to as chips), that contain a circuit and antenna, are embedded in the plastic of your credit or debit card and transmit data to the RFID reader. The reader interprets the radio waves into some of the same data that’s stored on the RFID chip. How Do RFID Readers Work? All a thief needs to do is to have an RFID reader (also called transceivers or interrogators). They hide the reader in their coat pocket, purse or backpack and come within inches of you in order to read your credit card’s RFID chip in just a few seconds. So, any crowded area is fair or, in this case, unfair, game. Once a thief’s reader has captured your RFID data, which could include your name, credit card number, expiration date, security code and other personal information associated with your credit card, they can easily upload it onto his computer. RFID technology is also used in passports, employee badges, some driver’s licenses and other identification cards. While early RFID embedded credit and debit cards transmitted enough personal information for a thief to potentially make a clone card, most banks and credit card companies now say they’ve put measures in place to keep a thief from robbing you blind. Nearly all cards now automatically change their internal security code after one purchase. So, even if a thief got enough information to successfully use your card number, he or she could only make one purchase. Still, it’s an unsettling thought that any of your personal information could be transmitted without your knowledge. Do RFID Wallets Really Work? Not entirely, say experts, and some are better than others. Consumer Reports participated in a RFID wallet and shield testing experiment with security experts and found that, out of the 10 products tested, none completely blocked out the radio transmissions from RFID chips. Furthermore, they found a huge disparity between brands — and even between products made by the same manufacturers. They even tested a homemade shield made solely out of duct tape and aluminum foil, and it offered more protection for RFID cards than 8 of the 10 products commercially sold. Does Your Card Have an RFID Chip? 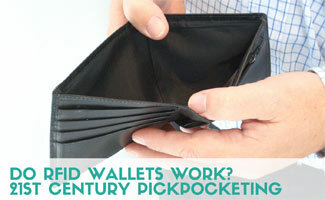 As we mentioned above, there are some RFID wallets that work better than others. Here are some of our recommendations for based on what we’ve found in our research about independent testing, customer feedback and other factors. Signal Vault is one of the most popular manufacturers of RFID products. Their RFID Blocking Credit & Debit Card Protector was tested by Qualtest, Inc., now part of National Technical Systems, in their Electromagnetic Interference Chamber. Testing found that the Signal Vault RFID blocking product effectively protects credit and debit cards from being read electronically, according to Signal Vault and Qualtest, Inc. Learn more about RFID and how it happens in this news story from Fox News. Why Worry About The Person Standing Behind You In Line? Using a RFID blocking credit card protector isn’t a replacement for good old common sense. Keep your valuable cards in a secure place at home when possible and always monitor your credit card and bank account statements for fraudulent charges. Although RFID-blocking technology isn’t completely secure, it’s better than leaving your credit, debit and other identification cards entirely exposed. Would you feel more protected using an RFID wallet? I recently purchased 6 of these, they look like credit cards themselves, made by (assumed) who it says on these cards, “RFID SCAN BLOCKER” WITH an address listed as a website “CARDSAFEGUARD BLOCKER”. Then there is a mark in the lower right corner that says “IDSECURE” with a small picture of a padlock next to this mark. Has anybody had any experience with this brand of card? I have a feeling I’ve just been clipped for $24! I’ve seen and heard more and more about these lately. I think I’m going to get one for my husband for Christmas this year!